This post is a review of Alex Davis' 2015 URCA presentation: Defensive Positioning for Shut-Down Defense. Alex is a longtime member of historic men's club Vancouver Furious George and a coach for Team Canada. "If you don't know who I am, that's in large part because I think I'm pretty good at shut-down defense. It's one of the most touted forms of defense, but not one easily learned through highlight reels." That's how Alex begins his engaging talk on one of the most talked-about skills in ultimate that is the hardest to teach, learn, and appreciate. Do you know how to do it? Are you an ace defender already? Can you teach others? In this talk, Alex uses his careful, well-segmented approach to break down what's made him worthy of the title of D-line captain for one of ultimate's storied clubs. He even explains why rectangles are his favorite shape for drawing out on-field situations. Here are a couple of cool clips. "Shut-down defense is a misnomer." "Prioritization." 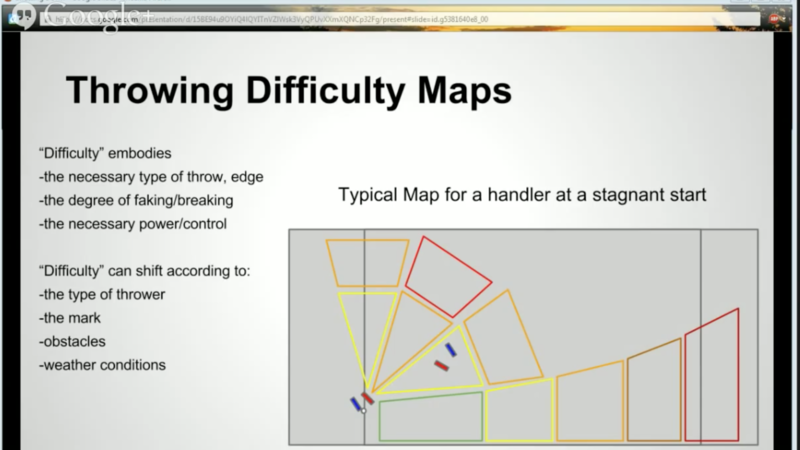 Alex walks through a compilation of the qualitative contour maps he presents in this talk to talk about how he thinks through his positioning. There are several common styles of defense: poaching, baiting, and shutdown defense. At the intermediate levels, most captains and coaches don't want you doing the first two. Whatever the team defensive strategy is, know your role. Get rid of the notion that your defense can reach a point where you can always stop someone from getting the disc. Alex tells us that it isn't possible. You need to play the statistics of the field. You can learn to think through a cutter's options to prioritize their most viable space and stop them from getting there. The best defenders aren't phases by fakes or quick pivots, because they know the team strategy and understand where the biggest threats on the field are. Alex's mathematical approach is valuable for two reasons. One, he is able to segment out common situations into such great detail that it can help explain many details that might go unnoticed by coaches, captains and players. Two, it is a highly unique approach to ultimate strategy. Alex's dedication to his contour maps, his careful analysis, and his overall experience blend themselves into a voice that is unlike any other in the URCA Library, and perhaps in the ultimate community at large. Like Alex's approach? See more talks from Alex and a suite of disc flight dynamic videos on the way. Stay tuned to the blog and our social media streams for announcements! Tell us what you think about Alex's approach in the comment section. Watch his entire talk here.